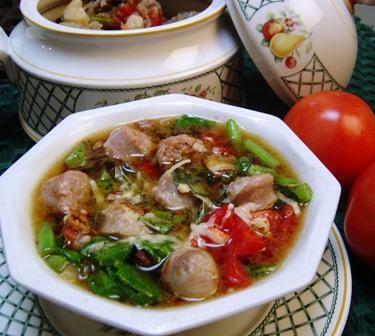 The fresh vegetables, sausage and pecans combine with the perfume of fresh basil. Pecans add a Minestrone is a thick soup that is hearty enough to be a complete meal. This is a one-dish dinner that can be made in 20 minutes. Fresh trimmed green beans and diced celery are available in the produce section of most markets. These make prep time a breeze. Or, slice the vegetables in a food processor fitted with a medium slicing blade. Heat the oil in a large saucepan over medium-high heat. Add the sausage, onion and green beans. Sauté for 5 minutes. Do not brown the vegetables. Add the tomato and broth. The broth should cover the vegetables. Add water, if needed. Bring to a simmer and partially cover with a lid, leaving space for steam to escape. Simmer for 10 minutes. Add salt and pepper to taste. Remove from heat. Stir in the spinach and basil. Let stand 1 minute. While soup cooks, bring a large pot filled with 2 to 3 quarts water to a boil. Add the acini pepe pasta and boil 8 minutes or until pasta is cooked al dente. Drain. Spoon pasta into bowls and ladle soup on top. Sprinkle each bowl with Parmesan cheese and pecans. Makes 2 servings. To buy: 1 medium tomato, 1 small package washed ready-to-eat spinach, 1 small bunch fresh basil, 1 package trimmed green beans, 1 small package broken pecans, 1 small piece Parmesan cheese, 1 small package acini pepe pasta and 1/2 pound low-fat turkey sausage. Staples: Olive oil, onion, fat-free, low salt chicken broth, salt and black peppercorns. Buy good quality Parmesan cheese and ask the market to grate it for you or chop it in the food processor. Freeze extra for quick use. You can quickly spoon out what you need and leave the rest frozen. While soup simmers, boil pasta.